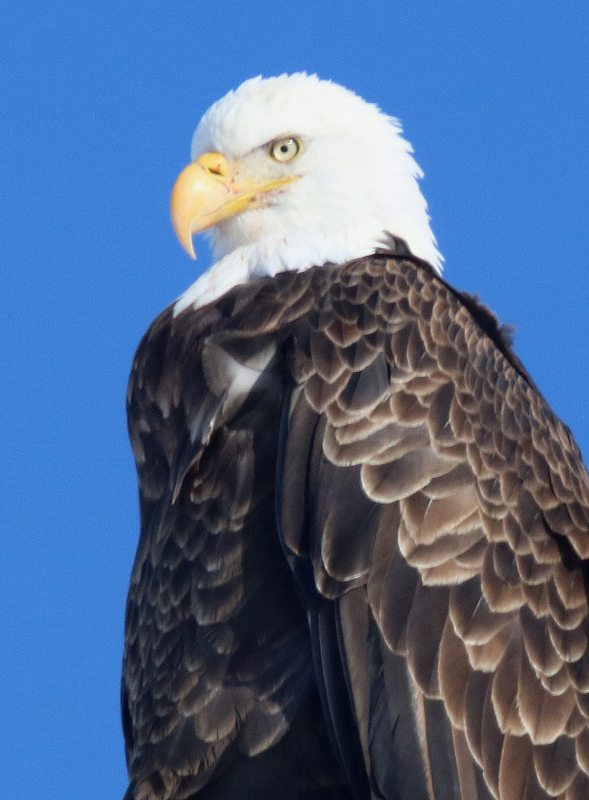 It’s exciting to see such detail in the plumage of a Bald Eagle; notice the full crop of this trusting bird that Paul photographed last Friday morning. 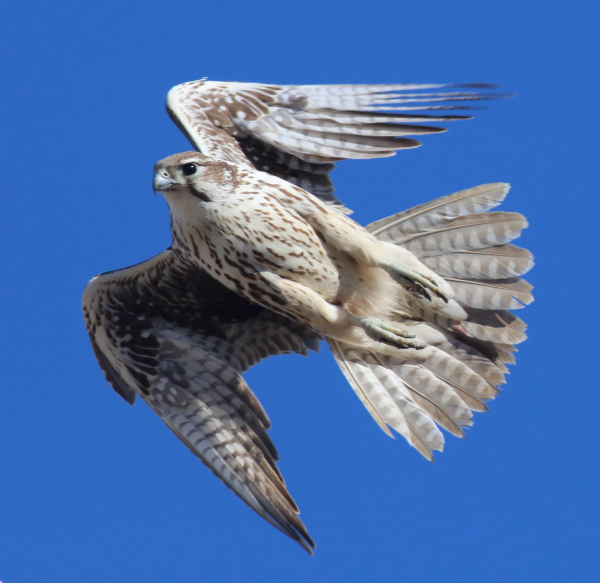 The speed and aerodynamics of a Prairie Falcon provide a nearly perfect combination for avian flight. During the two-day break between the deep freeze of the polar vortex and this week of below zero “high” temperatures, I dashed to my favorite South Dakota winter raptor hotspot. It wasn’t hot, but the temperatures wonderfully warm in the low 40s, and the birds were thrilling. As I’ve related before, I’m a real fan of Golden Eagles, and last Friday I found a record high 18 Goldens in one day, along with 16 Bald Eagles, 18 Rough-legged Hawks, 15 Red-tailed Hawks, 3 Northern Harriers, a spicy Prairie Falcon and a beautiful male American Kestrel; that’s 72 raptors on a beautiful warm sunny day – Whoo-woo! I tallied similar numbers of raptors Saturday, with the addition of a Cooper’s Hawk and a Ferruginous Hawk, and a total of three Prairie Falcons. What Fun! Throughout the entire trip, I had the potential of finding a Gyrfalcon in mind. The timing was right, the weather leading up to the weekend was right, the location was real right. But Gyrs are super-rare, even in the center of the SoDak winter raptor hotspot around Pierre, so it’s never disappointing not to find one, it’s just a matter of being aware and being ready. Saturday, mid-afternoon, as I was returning north to Pierre, I turned off my usual course to drive five miles or so down the infamous County Line Road, which is probably the best bet for finding a Gyrfalcon, considering local reports over the years (although I hadn’t seen one there yet). About four miles east I spied a raptor perched far ahead. Likely a Rough-leg by its size and shape, but maybe. I stopped short to take a “just in case” look with my binoculars, but the big raptor took flight, and I could see this was a very big falcon! My imagination went wild: I envisioned a whitish Gyrfalcon with tan markings, and immediately raised my camera and followed the mega-falcon as it flew parallel to my position – toward me, parallel, then past me. I took a series of photos as the falcon winged by, and I continued to watch its flight to be assured of where it might perch. The big falcon alighted high on a pole and I was so excited with the photo opportunity moments before that I had to take a quick look at the resulting images. As the first photograph came up on the monitor on the back of my camera, Boom – my Gyr images were blown up when I saw an obvious Prairie Falcon in the frame. What? Boy did I get fooled; or did I fool myself? Funny what tricks the mind can play; but I really never had an appropriate look at the big falcon, which must be the biggest female Prairie Falcon I’ve ever seen. I really did envision the white coloration too, but the underside of Prairies is white, and I had that Gyrfalcon imagination going strong. Ha-ha, joke’s on me. But hey, it’s still a big female Prairie, a spectacular fall and winter visitor to the Great Palins. I decided to try for a little closer photo of the big falcon, but it seemed to be hip to my interests and flew far in advance of my approach. Even so, again it flew parallel north of me where the sun was illuminating it best, and I managed a similar series of photos as before. While I was on County Line Road, I wanted to check out a prairie dog town a mile or so farther down the road, where I enjoyed photographing a perched Golden Eagle – a beauty. There were other birds in addition to the concentration of raptors: South of Pierre, I encountered a few small flocks of Western Meadowlarks, larger flocks of Horned Larks, two Northern Flickers and a few Greater Prairie Chickens, while regal Ring-necked Pheasants were the most commonly encountered birds, including a couple mega-flocks numbering in the 40s and 60s. The open water of the Missouri River in the Pierre area holds remarkable numbers of Canada Geese during winter with a scattering of Cackling Geese among them, and the sight and sounds of flocks of geese flying through a beautiful February sunset was memorable. In addition, I was delighted to find and photograph a light-colored Great Horned Owl perched in the top window of an old metal-paneled barn. Plus, during my Saturday return north of the border, I spied a young Snowy Owl perched on a fencepost in the distance amid an expansive snowy plain – the last bird of the trip. My Friday-Saturday trip to south-central South Dakota was so enjoyable and productive that I wanted to share another SoDak episode with you by showcasing a memorable series of Golden Eagle photos that I took Friday afternoon in this issue’s Bird Photography article. I include the story behind the eagle images and the techniques I used, so I hope you enjoy the article and photos.